The Independent State of Papua New Guinea (informally, Papua New Guinea or PNG) is a country in Oceania, occupying the eastern half of the island of New Guinea and numerous offshore islands (the western half of the island is occupied by the Indonesian provinces of Papua and West Irian Jaya). PNG has a rugged terrain with very few cities. 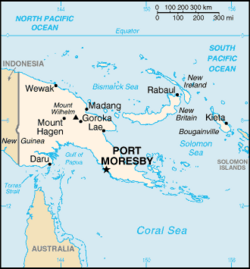 Its capital is Port Moresby. There are more than 700 indigenous languages spoken and at least as many indigenous societies, all within a population of only 5.6 million. The national motto is Unity in Diversity. 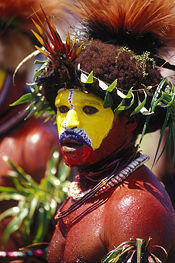 Papua New Guinea is located in the southwestern Pacific Ocean, in a region defined as Melanesia. With a land area of 452,860 square kilometers, Papua New Guinea is slightly larger than California. The country's geography is rugged. A spine of mountains runs the length of the island of New Guinea, forming a populous highlands region. The highest peak is Mount Wilhelm at 4,509 meters. Dense rainforests can be found in the lowland and coastal areas. This terrain has posed enormous difficulties in building a transportation infrastructure. In some areas, planes are the only mode of transport. To support this, Papua New Guinea has 572 airstrips. The country is situated along a fault line, making earthquakes and the resultant tsunamis relatively common occurrences. With a tropical climate and prevailing winds from the northwest, one monsoon season extends from December to March until the prevailing winds shift. Winds change and come from the southeast causing a second annual monsoon season from May to October. Papua New Guinea is an equatorial country, yet it has snowfall in the elevated regions due to the eight to ten months of yearly precipitation. Papua New Guinea's largest landmass is on the island of New Guinea which is also home to the country's cities; Port Moresby, Lae, and Mount Hagen. The outlying islands include New Ireland, New Britain, and Bougainville. The country is part of the Australasia ecozone, which also includes Australia, New Zealand, eastern Indonesia, and several Pacific island groups, including the Solomon Islands and Vanuatu. Geologically, the island of New Guinea is a northern extension of the Indo-Australian tectonic plate, forming part of a single landmass known as Australia-New Guinea which is also called Sahul or Meganesia. It is connected to the Australian segment by a shallow continental shelf across the Torres Strait, which during ice ages, when sea levels were lower, it is believed to have been exposed as a land bridge. The fact that many birds and mammals found on New Guinea have close genetic links with corresponding species in Australia supports this belief. For example, several species of marsupial mammals, including some kangaroos and possums resemble species found on New Guinea. Australia and New Guinea are portions of the ancient supercontinent of Gondwana, which started to break into smaller continents in the Cretaceous era, 130-65 million years ago. Australia separated from Antarctica about 45 million years ago. All the Australasian lands are home to the Antarctic flora, descended from the flora of southern Gondwana, including the coniferous podocarps and Araucaria pines, and the broad-leafed southern beech (Nothofagus). These plant families are still present in Papua New Guinea. New Guinea is part of the humid tropics, and many Indomalayan rainforest plants spread across the narrow straits from Asia, mixing together with the old Australian and Antarctic floras. Natural hazards include active volcanism, since the country is situated along the Pacific "Ring of Fire," frequent and sometimes severe earthquakes, mud slides, and tsunamis occur. Environmental issues include deforestation of rain forests as a result of growing commercial demand for tropical timber, pollution from mining projects, and severe drought. 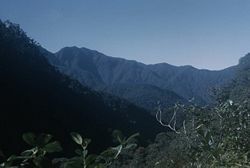 Densely forested mountains in the Ekuti range of Central Papua. Human remains found on New Guinea have been dated to 50,000 years ago. These inhabitants probably originated in Southeast Asia. Anthropologists date agriculture as developing in the New Guinea highlands nearly 9,000 years ago, making it one of the areas of original plant domestication in the world. A migration of Austronesian speaking peoples came to coastal regions roughly 2,500 years ago. This is correlated with the introduction of pottery, pigs, and certain fishing techniques. About 300 years ago, the sweet potato was introduced by the then-locally dominant colonial power, Portugal. The far higher crop yields meant sweet potato largely supplanted the previous staple, taro, and gave rise to a significant increase in population in the highlands. European explorers had encountered the country as early as the sixteenth century. The country was named in the nineteenth century. The word "Papua" is derived from a Malay word describing the frizzy Melanesian hair, and New Guinea or Nueva Guinea was the name coined by the Spanish explorer Yñigo Ortiz de Retez, who in 1545 noted the resemblance of the people to those he had seen along the Guinean coast of Africa. The northern half of the country came into German hands in the late nineteenth century as German New Guinea. During World War I, it was occupied by Australia, which had begun administering the southern part as Papua as the colony formerly known as British New Guinea in 1905. After World War I, Australia was given a League of Nations mandate to administer the former German New Guinea. Papua, by contrast, was deemed to be an External Territory of the Australian Commonwealth, though it remained a British possession. This difference in legal status meant that Papua and New Guinea had entirely separate administrations, both controlled by Australia. The two territories were combined into the Territory of Papua and New Guinea after World War II, and later simply referred to as "Papua New Guinea." The administration of Papua was now also open to United Nations oversight. However, certain statutes continued (and continue) to have application only in one of the two Territories, a matter considerably complicated today by the adjustment of the former boundary among contiguous provinces with respect to road access and language groups, so that such statutes apply on one side only of a boundary that no longer exists. Independence from Australia occurred in September of 1975. Relations with Australia have continued to show signs of strain. While on a state visit in March of 2005, Prime Minister Somare was asked to submit to a security check and remove his shoes upon arriving at Brisbane airport. Australia refused to apologize. Problems arose over Australia's latest $A760 million aid to tackle crime and corruption by sending 200 Australian police to Port Moresby and installing 40 Australian officials within the national bureaucracy. After the first detachment of police arrived, Papua New Guinea's high court ruled that the arrangement was unconstitutional, and the police returned home. Papua New Guinea is a member of the Commonwealth of Nations and Elizabeth II of the United Kingdom is the head of state. She is represented in Papua New Guinea by the Governor-General, Sir Paulias Matane. Actual executive power lies with the prime minister, who heads the cabinet. The single-chamber parliament has 109 seats, of which 20 are occupied by the governors of the 20 provinces. Candidates for parliament are voted upon when the prime minister calls a national election, a maximum of five years after the previous national election. In the early years of independence, the instability of the party system led to frequent votes of no-confidence in Parliament with resulting falls of the government of the day. Legislation preventing such votes sooner than 18 months after a national election was passed, resulting in greater stability. Elections in PNG attract large numbers of candidates. Since independence in 1975, members have been elected by the first-past-the-post system, with winners frequently gaining less than 15 percent of the vote. Electoral reforms, in 2001, introduced the Limited Preferential Vote system (LPV). The 2007 general election was the first to be conducted using LPV. Papua New Guinea was to be a unitary, as opposed to federal, state. 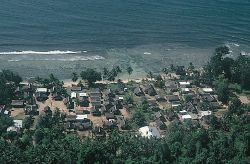 However, a rebellion in the District of Bougainville, in 1975, occurred immediately before the granting of independence. This event raised the prospect of the richest area, whose Bougainville Copper Mine was the source of most of the gross national product, departing and leaving the newly independent country virtually impoverished. As a concession to the Bougainville nationalists, a form of provincial government was offered; subsequently, this was also conferred on the other 18 districts of the country. This created a total of nineteen provinces plus the National Capital District. There have been numerous suspensions of provincial governments on the grounds of corruption or incompetence of the elected provincial leaders. Legislation is introduced by the executive government to the legislature, debated, and if passed, becomes law when it receives royal assent by the Governor-General. Most legislation is actually regulation implemented by the bureaucracy under enabling legislation previously passed by Parliament. The "underlying law" is the common law of Papua New Guinea and consists of English common law as it stood at September 16, 1975 (the date of Independence), and thereafter the decisions of PNG’s own courts. The courts are directed to take note of the "custom" of traditional communities. This has proved extremely difficult, so statutes are largely adopted from Australia and England. Advocacy in the courts follows the adversarial pattern of other common law countries. Most people live in indigenous societies and practice subsistence-based agriculture. The PNG constitution expresses the wish for traditional villages and communities to remain as viable units of Papua New Guinean society and for active steps to be taken in their preservation. Papua New Guinea is richly endowed with natural resources, but proper exploitation of these resources is hampered by rugged terrain, the high cost of developing infrastructure, serious law and order problems, and the system of land title. This system makes identifying the owners of land, for the purpose of negotiating appropriate agreements, problematic. Agriculture provides a subsistence livelihood for 85 percent of the population. Mineral deposits, including oil, copper, and gold, account for 72 percent of export earnings, with other exports including logs, palm oil, coffee, cocoa, crayfish, prawns. Export partners are Australia at 28 percent, Japan 5.8 percent, Germany 4.7 percent, and China 4.6 percent as of 2004. Import commodities include machinery and transport equipment, manufactured goods, food, fuels, and chemicals. Import partners are Australia at 46.4 percent, Singapore 21.6 percent, Japan 4.3 percent, and New Zealand 4.2 percent. Papau New Guinea's system of government has brought stability to the national budget, largely through expenditure control. Numerous challenges include regaining investor confidence, restoring integrity to state institutions, promoting economic efficiency by privatizing moribund state institutions, and balancing relations with Australia, the former colonial ruler. Other socio-cultural challenges include an HIV/AIDS epidemic, law and order, and land tenure issues. Australia annually supplies A$240 million in aid, which accounts for nearly 20 percent of the national budget. Only 3 percent of the land of Papua New Guinea is alienated (in private hands). It is privately held under 99-year state leases, or it is held by the state itself. There is virtually no freehold title of land (fee simple); the few existing freeholds are automatically converted to state lease when transferred between vendor and purchaser. Title for unalienated land is communal and in the hands of traditional clans. A problem of economic development is identifying who the membership of customary landowning groups is, and thus who the owners are. Disputes between mining and forestry companies and landowner groups often concern whether the companies entered into contracts with the true owners. This customary land covers 97 percent of total land area. Huli Wigman from the Southern Highlands. All three major ethnic groups in the Oceania region—Melanesians, Micronesians, and Polynesians—are represented in Papua New Guinea. Chinese, Europeans, Australians, Filipinos, Sri Lankans, and Indians also reside in the country. There are three official languages for Papua New Guinea, in addition to over 700 indigenous non-Austronesian (or Papuan languages) and Austronesian languages. An incredible 10 percent of the world's total languages are spoken in PNG. English is one of the official languages, although few speak it. 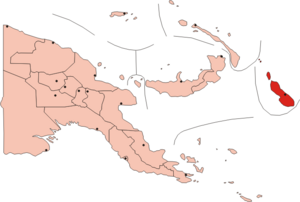 Many people—mostly on the "New Guinea side," that is, the northern half of mainland PNG and the New Guinea Islands—speak the creole language New Guinea Pidgin ("Tok Pisin"). Much of the debate in the PNG Parliament and many newspapers is conducted in Tok Pisin. In the southern region of Papua, many people use the third official language, Hiri Motu, rather than Tok Pisin. Hiri Motu is largely unknown outside Port Moresby, where it has become increasingly common in recent years with the influx of Pidgin-speaking highlanders. With an average of only 7,000 speakers per language, Papua New Guinea has a greater density of languages than any other nation on earth except Vanuatu. Traditional Papua New Guinea village. The majority of citizens are members of a Christian church; however, many citizens combine their Christian faith with some pre-Christian traditional indigenous practices. Minority religions, with fewer than 20,000 adherents, include the Jehovah's Witness, Church of Christ, Bahá'í Faith, and Islam, largely foreign residents of African and Southeast Asian origin. Non-traditional Christian churches and non-Christian religious groups are active throughout the country. Traditional religions were often animist and some also tended to have elements of ancestor worship though generalizations are invidious given the extreme heterogeneity of Melanesian societies. More than a thousand different cultural groups exist in PNG. Because of this diversity, many different styles of cultural expression have emerged; each group has created its own expressive forms in art, dance, weaponry, costumes, singing, music, architecture, and much more. Most of these different cultural groups have their own language. People typically live in villages that rely on subsistence farming. To balance their diets, they go hunting and collect wild plants (such as yams roots) for food. Those who become skilled at hunting, farming, and fishing earn a great deal of respect. On the Sepik River, a group of indigenous people is known for their wood carvings. They create forms of plants or animals, because they believe these are their ancestors. Sea shells were abolished as currency in 1933. However, in some cultures, to get a bride, a groom must bring a certain number of golden-edged clamshells as a brideprice. In other regions, brideprice is paid in lengths of shell bead money, pigs, cassowaries, and cash. People of the highlands engage in colorful local rituals that are called "sing sings." They paint themselves, and dress up with feathers, pearls and animal skins to represent birds, trees, or mountain spirits. Sometimes an important event, such as a legendary battle, is enacted at such a musical festival. Sport is important. PNG has strong teams in Australian rules football including the second greatest number of players of any country in the world, soccer, rugby union and rugby league, which is considered the national sport. Location of North Solomons (Bougainville) Province in Papua New Guinea. 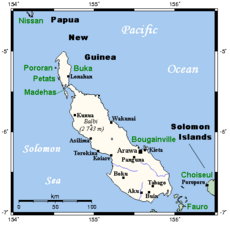 Bougainville is part of Papua New Guinea and is the largest of the Solomon Islands group. Bougainville, the adjacent island of Buka, and assorted outlying islands including the Carterets are sometimes known as North Solomons. Together they make up the Papua New Guinean province of that name. The population is 175,160 (2000 census). The island is ecologically and geographically, although not politically, part of the Solomon Islands. Buka Island, Bougainville, and most of the Solomons are part of the Solomon Islands rain forests eco-region. The island was named after the French navigator Louis Antoine de Bougainville His name has also been lent to the creeping tropical flowering vines of the bougainvillea family. In 1885, it came under German administration as part of German New Guinea. Australia occupied it, in 1914, and, as a League of Nations mandatory power, administered it from 1918 until the Japanese invaded in 1942 and then again from 1945 until PNG independence as a United Nations mandatory power. The island was occupied by Australian, American and Japanese forces during World War II. It was an important base for the United States Army Air Force, Royal Australian Air Force, and Royal New Zealand Air Force. On March 8, 1944, American forces were attacked by Japanese troops on Hill 700 on this island. The battle lasted five days, ending with a Japanese retreat. The island is rich in copper and possibly gold. The Bougainville Revolutionary Army (BRA) ostensibly reclaimed the country from corporate mining interests in the 1980s, in the form of Bougainville Copper Limited, (BCL) an Australian controlled company. The mining activity triggered a nine-year secessionist revolt that claimed 20,000 lives. The bloodshed ended in 1997, after negotiations successfully brokered by New Zealand. During most of the revolt the island was also under blockade, which forced the people to supply themselves with everything from electric power to soap. Biodiesel fuel was refined out of coconut oil to fuel vehicles as well as building a small hydroelectric power station out of old vehicle parts. The resourcefulness of these people can be seen in their use of the coconut which besides biodiesel was also used for making soap, lamp oil, baskets, treating wounds and placed in the coals of a fire to act as a mosquito repellent. The region is still striving for autonomy, motivated in part by fear of re-established corporate exploitation of the area. On June 15, 2005, the election of the first autonomous government of Bougainville, presided by Joseph Kabui, was held. On July 25, 2005, rebel leader Francis Ona died after a short illness. A former surveyor with the Bougainville Mining Limited, Ona started the 10 year secessionist war in November 1988 with sabotage attacks on the mine in Panguna in support of demands for compensation for environmental damage. ↑ Guide to Papua New Guinea guidesandmaps.net. Retrieved February 11, 2019. ↑ 2.0 2.1 Central Intelligence Agency, Papua New Guinea World Factbook. Retrieved February 11, 2019. ↑ Papua New Guinea Population (2016). Retrieved February 11, 2019. ↑ 4.0 4.1 4.2 4.3 Papua New Guinea. International Monetary Fund. Retrieved November 14, 2011. 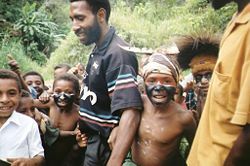 History of "Papua New Guinea"
This page was last modified on 12 February 2019, at 01:11.